Just before Mike Stanton became a key cog in the great Yankee bullpens that helped the team win three straight World Championships, beginning in 1998, he was a reliever for the Red Sox. A left-hander, this native of Houston, Texas didn’t begin pitching until he got to college but mastered the art quick enough to get selected in the 13th round of the 1987 MLB amateur draft by the Atlanta Braves. He made his big league debut with the Braves two years later and impressed the organization by saving 7 ball games, compiling a 1.50 ERA and striking out more than a hitter an inning during his 20-game first-ever trial. Stanton spent six-plus seasons in Atlanta, including 1993, when he became the team’s closer and saved a career high 27 games. He lost the closer’s job to Greg McMichael the following year and was traded to the Red Sox at the mid-season trading deadline in 1995. He appeared in 20 games for Boston during the second half of that season and pitched well, going 1-0 with a 3.00 ERA. He also had a scoreless 2 1/3 inning appearance in that year’s ALDS versus Cleveland, in which the Red Sox were swept in thee games. 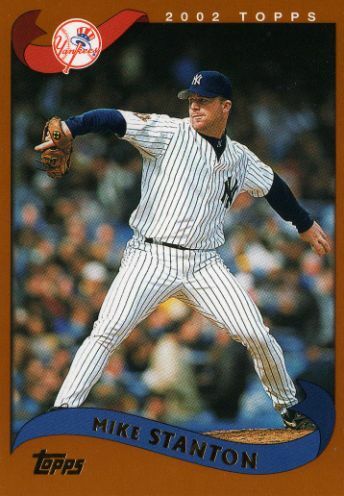 He then became Kevin Kennedy’s left-handed workhorse reliever in 1996 appearing in 59 games, before getting dealt to the Rangers for two relievers at that season’s July 31st trading deadline. The Yankees then signed him as a free agent following the 1996 season and for the next half-dozen years, he was Joe Torre’s first southpaw choice out of the bullpen. He had a good, moving fastball and when his slider and curveball were working, this guy was simply nasty, especially on left-handed hitters. I loved his toughness and no-nonsense demeanor on the mound. He was the type of pitcher who believed he could get any hitter out in any situation.